A mashup of Forza Horizon 3, Driveclub, The Crew Wild Run, and 2015's Need For Speed game. Forza Horizon 3 has us pretty fired up over photorealistic graphics and its extensive list of cars. But to get a really direct comparison of how it visually stacks up to other driving games, you’ve got to try the same car and conditions in each virtual world back-to-back-to-back. That’s exactly what YouTuber RacingVideoGames has done for us here– giving you the opportunity to check out a Yas Marina Blue Metallic BMW M4 in Forza Horizon 3, Driveclub, The Crew Wild Run, and the latest Need For Speed game. The clip takes us through some static moments, driving, different lighting and weather conditions, and damage showcasing a few environments and cars. To be honest they all look pretty slick to me. My gut reaction is that Forza is the prettiest, NFS seems to have the most forgiving “arcade style” physics, Driveclub is somewhere between and it’s neat that The Crew apparently lets you make your own license plate. 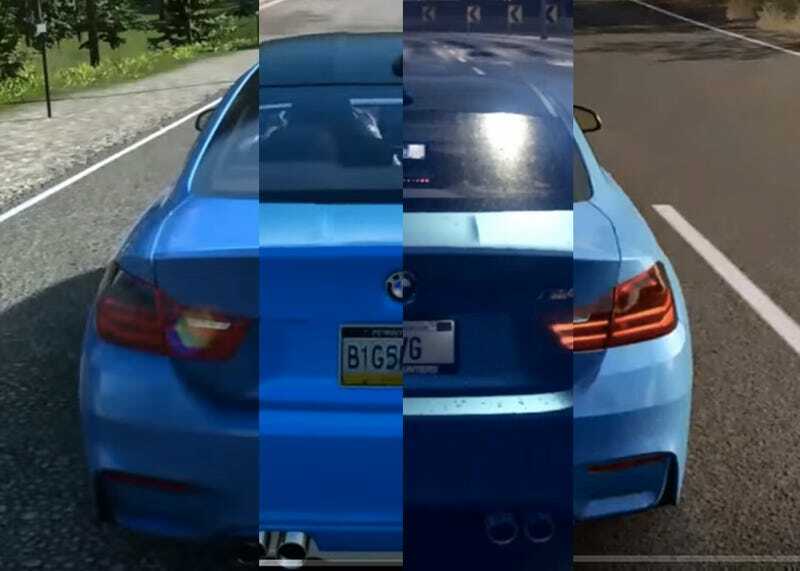 Looking closer you can dissect more differences in how the camera follows the car, subtle differences in sound effects, and how the sensation of speed varies between games. Obviously this video is a purely visual comparison– there’s no commentary or gameplay analysis at all.